Clove Oil the dried flower buds of an aromatic tree cloves are used as a spice in cuisines all over the world. Cloves are now harvested primarily in Indonesia , Madagascar , Pakistan , Sri Lanka and in India. Clove is the immature flower bud of the clove plant that is harvested and processed for culinary and medicinal use. The young bud is pink in color and then darkens to a fiery red, at which point it is harvested and dried turning a deep reddish brown. The small bud is composed of gums, tannins and volatile oil. The comprised of eugenol(85%), acetyl (wintergreen oil, found in many plants), Clove is the immature flower bud of the clove plant that is harvested and processed for culinary and medicinal use. The young bud is pink in color and then darkens to a fiery red, at which point it is harvested and dried turning a deep reddish brown. The small bud is composed .The volatile oil of the clove is %), acetyl eugenol, methyl salicylate (wintergreen oil, found in many plants), pinen and vanillin . Bud Oil is derived form the flower-buds of S.aromaticum. It consists of 60-90% eugenol, eugenyl acetate, caryophyllene and other minor constituents. Leaf Oil is derived from the leaves of S.aromaticum. It consists of 82-88% eugenol with little or no eugenyl acetate, and minor constituents. Stem Oil is derived from the twigs of S.aromaticum. It consists of 90-95% eugenol, with other minor constituents. Cloves have antiseptic, disinfectant and germicidal properties. Clove oil is effective as a broad spectrum antibiotic. Historically, dentists used powdered cloves to disinfect and treat tooth infections and treat gum disease. (Their patients probably appreciated the numbing effect of the cloves. Clove oil is effective for the treatment of diarrhea and eradicating the fungus that caused athlete’s foot. Several drops of clove oil diluted with garlic, olive or sesame oil can be dripped into the ear to disinfect ear canals and remedy the cause of ear infection. 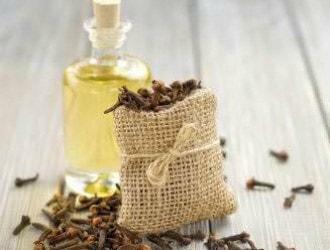 Diluted clove oil can be used topically to treat acne, wounds, scabies, insect bites and prickly heat. The whole clove or a ground powder is used in cooking throughout the world. Cloves are rich in manganese. Cloves contain significant amounts of potassium, phosphorus, magnesium and calcium. Cloves are a good source of vitamins C and K, and to a lesser degree, vitamins A and B-complex. Cloves are also a great source of dietary fiber and omega-3 fatty acids. Cloves contain Eugenol, which relieves pain and inflammation. Clove oil can relieve toothaches and earaches. Clove oil spray has been used to help relieve bronchial inflammation and cough. Cloves are safe to use in pregnancy, and clove tea can ease the nausea and vomiting commonly referred to as morning sickness. Cloves aid in digestion and can relive gastric and intestinal gas. The stimulativeeffect of the clove aids the metabolic processes of the body. Cloves have antispasmodic and expectorant properties. Topical use of clove oil can ease muscle spasms. A diet rich in cloves can repel insects. The clove oil creates a smell and taste insects don’t like, so they don’t bite you. Clove studded oranges have been used for hundreds of years in closets to repel moths and protect clothing. A diet rich in cloves can repel insects. The clove oil creates a smell and taste insects don’t like, so they don’t bite you. Clovestudded oranges have been used for hundreds of years in closets to repel moths and protect clothing. The most prominent use of clove oil is in dental care. The germicidal properties of the oil make it very effective for relieving dental pain, toothache, sore gums and mouth ulcers. Clove oil contains the compound eugenol, which has been used in dentistry since numerous years. Gargles with diluted clove oil help in easing the throat. The characteristic smell of clove oil helps removing bad breath. As a result, clove oil is added to numerous dental products and medications, including, mouth washes, and tooth pastes. Dentists also mix clove oil with zinc oxide and prepare a white filling material as a temporary alternative to root canal. Due to its antiseptic properties, clove oil is useful for wound, cuts, scabies, athlete’s foot, fungal infections, bruises, prickly heat, scabies, etc. It can also be used insect bites and stings. Clove oil is often recommended for skin care, especially to acne patients. Clove oil is aphrodisiac in nature and hence serves as an excellent stress reliever. It has a stimulating effect on the mind and removes mental exhaustion and fatigue. When taken internally, in appropriate amounts, it refreshes the mind. Clove oil also induces sleep and is helpful to insomnia patients. It is useful for treating mental problems such as loss of memory, depression and anxiety. Clove oil has a cooling and anti inflammatory effect, and thereby clears the nasal passage. This expectorant is useful in various respiratory disorders including coughs, colds, bronchitis, asthma, sinusitis, and tuberculosis. Chewing a clove bud eases sore throats. A mixture of warm clove oil and sesame oil is a good remedy for ear aches. Along with blood purification, clove oil also helps in controlling the blood sugar levels and hence is useful to diabetics. Both clove and clove oil are useful for boosting the immune system. Its antiviral properties and ability to purify blood increases your resistance to diseases. 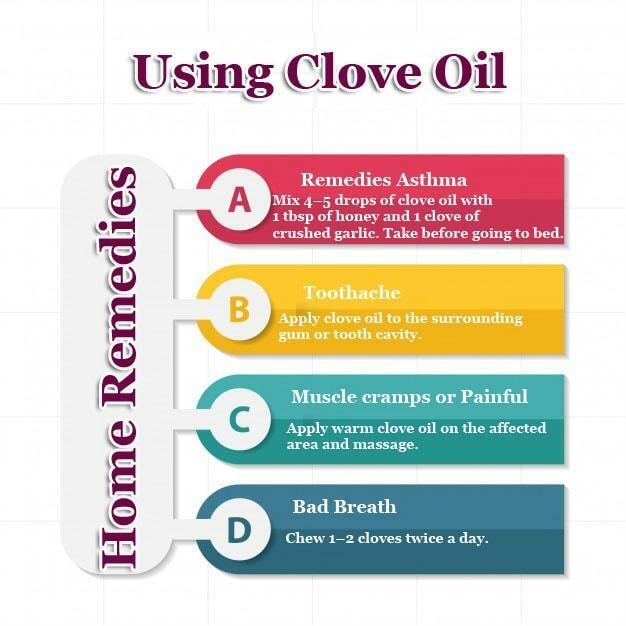 Clove and clove oil is a very effective home remedy for treating sty. Sty is an inflammation on the eyelash and is a very irritating condition. Sty is not only painful, but also causes difficulty in the proper functioning of the eye. Usage of clove in making cigarettes is a new trend all over the world. Traditionally, clove was added in cigarettes in Indonesia. Smokers (wrongly) feel that the numerous health benefits of clove would nullify the ill effects of smoking. Flavoring Agent: Along with its digestive properties, clove oil is added in food items due to its flavor. It is added in many Indian dishes, pickles, sauce, spice cakes, etc. When you use clove oil for toothache pain, it’s the eugenol (an ingredient within clove oil) that provides relief. Eugenol is a natural anesthetic and antibacterial, and it works well at reducing inflammation in the mouth. In fact, a study that eugenol is much more effective than using another analgesic and doing nothing else. Researchers examined the symptoms of 270 patients who had a tooth extracted, and found that patients who had received a eugenol-based paste suffered the least pain, inflammation and related after effects. You can buy clove oil as a home remedy from most supermarkets, health food stores and drugstores. Sometimes the product is called “oil of cloves. “Keep in mind clove oil has an unpleasant taste and can have unpleasant side effects if eaten, so it should only be used for adults and older children who aren’t likely to swallow it by mistake. For younger children or teething babies, suggests cut it with a carrier oil like almond or a similar child-safe preparation that contains clove oil as the active ingredient. Here’s How To Use It? To start, you’ll need a piece of clean tissue, or a cotton swab or cotton ball. Briefly dip the tissue or cotton in the clove oil so that it soaks up just a few drops. Gently wipe the oil over your gums at the point of pain. You can also use a whole clove if you don’t have any clove oil handy. Place the clove on the affected area and leave it there until the pain comes down. If the effect of clove oil is too strong, use olive oil to dilute it. You can also take an over-the-counter pain relief medication such as ibuprofen or acetaminophen along with clove oil. How Do I Make Clove Oil? Pungent, piquant and peppery, cloves tie aromatics together in multifaceted dishes. You rarely find cloves as the main flavoring ingredient in a dish; they work best in supporting roles, such as infusions for finishing oils. Clove oil is used to anoint a dish with a suspicion of clove in the finish not enough to alter the flavor profile but just enough to make you think, “This has a little something special,” and wonder what it is. Clove oil is easy to make, and a little goes a long way. Toast about half a tablespoon of cloves in a saute pan over medium heat for every cup of oil you want to infuse. Toasting the cloves mobilizes their volatile oils and makes them easier to extract. Wash the bottle and cap you’ll use for the clove oil, along with a mortar, pestle and funnel. Fill the bottle with water and place it in a pot along with the mortar, pestle and funnel. Cover the items in the pot with a few inches of water and boil for 10 minutes. Take the items from the water and invert them on a paper towel. Rinse the cloves in a colander under cool water and spread them out on paper towels to dry. Dry the mortar with a paper towel, if you need to, and pour the cloves in it while it’s still warm from boiling. Lightly tap the cloves with the pestle to crack them. Pour the cracked cloves in the container, followed by high-quality extra-virgin olive oil. Use the funnel if you need to. Tighten the lid or stopper on the bottle and store it in a cool, dry place out of direct sunlight. Shake the bottle every couple of days. Infuse the oil with the cloves for two weeks, then taste it. If you want a stronger flavor, let the cloves steep for a few more weeks. If the flavor is where you want it, strain the oil through a sieve lined with cheesecloth and into an airtight sterilized serving bottle or container. Store the clove oil in the refrigerator and use within 1 month. Mix 4–5 drops of clove oil with 1 tbsp of honey and 1 clove of crushed garlic. Take before going to bed. Add 3 crushed cloves, 2 cardamoms, 2 tbsp of aniseed, 6–7 basil leaves and 1 tsp of cinnamon to 2 cups of water. Boil and allow to simmer until it has reduced to half. Drink this herbal decoction, once or twice a day. Apply clove oil to the surrounding gum or tooth cavity. Fry ½ tsp of clove powder, mix with 1 tbsp of honey and eat. Other uses Cloves are used to flavor foods, and are mixed with turmeric, cinnamon and chillies. In India, clove is also mixed with other herbs and eaten with betel leaf as a breath freshener and digestive aid. This unique page is quite engaging. I may definately be returning your blog.